The Blue Speedwave Slide is engineered for durability and safety. Instantly updgrade your swing set by attaching the Speedwave Slide to a 4' deck height. The scoop design with smooth handrails will keep your child secure while the deep set waves provide an exciting ride. This one-piece design is constructed of durable plastic that supports up to 250 pounds while offering speed and comfort. Easily mounts to any 42" to 48" deck height. The Speedwave Slide is proudly made in the US with a lifetime warranty against cracks and breaks. Mounts to 42 in. to 48 in. platforms, holds 250 lbs. Introducing the all new Monteagle Wood Complete Playset from Swing-N-Slide. It comes complete with all lumber, accessories, slides and hardware needed to build an experience your kids will enjoy for hours on end. The tower features a large 22 sq. ft. deck designed with a clubhouse style play area, a lookout terrace, and plenty of space below to play or add a sandbox. The tall 5' tower includes decorative windows and canopy tarp to keep kids dry and in the shade. This set also features 2 Cool Wave Slides carrying a lifetime warranty, down from the tower in multiple directions. In addition the Monteagle is equipped with heavy-duty swing hangers, swings, and a more durable ring/trapeze combo than most. The play set also features many other activities like a rock climbing wall, step ladder, and a picnic table. This wood complete features pre-cut, factory stained wood that is naturally resistant to insects and decay, and will keep your family having fun in the backyard for years to come. Just add wood for the perfect backyard swing set! The Pioneer Deluxe DIY Hardware Kit with Slide provides the thrilling fun of a swing set without taking up a lot of space. Perfect for a small backyard and small budget. This playset contains a slide, two swing seats, Iron Man rings, safety handles, and hardware.Lumber and wood screws are not included. 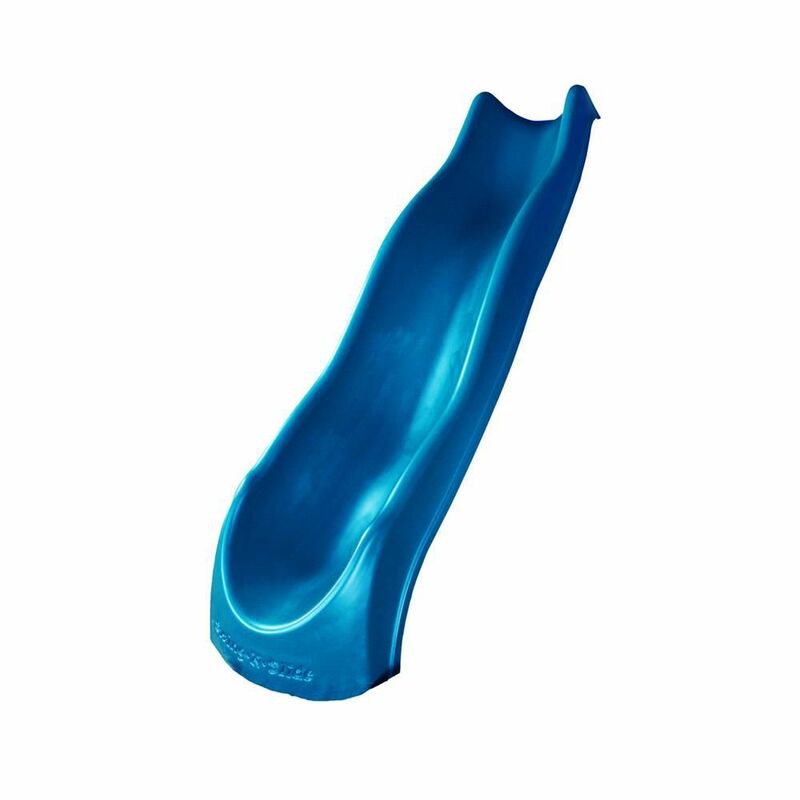 Speed Wave Slide in Blue The Blue Speedwave Slide is engineered for durability and safety. Instantly updgrade your swing set by attaching the Speedwave Slide to a 4' deck height. The scoop design with smooth handrails will keep your child secure while the deep set waves provide an exciting ride. This one-piece design is constructed of durable plastic that supports up to 250 pounds while offering speed and comfort. Easily mounts to any 42" to 48" deck height. The Speedwave Slide is proudly made in the US with a lifetime warranty against cracks and breaks.